Kim Abeles is an artist who crosses disciplines and media to explore and map the urban environment and chronicle broad social issues. The Smog Collector series brought her work to national and international attention in the art world, and mainstream sources such as Newsweek, National Public Radio, CBS Evening News, and the Walk Street Journal. A mid-career survey curated by Karen Moss and sponsored by the Fellows of Contemporary Art for the Santa Monica Museum, Kim Abeles: Encyclopedia Persona A-Z, toured the United States and South America, and was awarded the Best Regional Museum Show category for 1993-94 by the International Association of Art Critics. She continues to exhibit internationally, including recent projects in Vietnam, Thailand, Czech Republic, England, and China. Like teachers, visual artists are sometimes overwhelmed with an abundance of paperwork. Los Angeles artist Kim Abeles made the print in response to this issue. 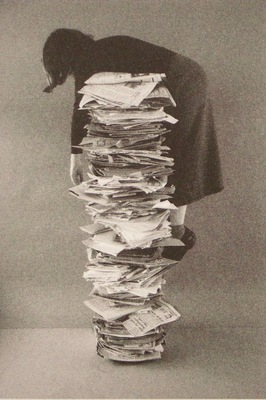 She took a year’s worth of her paperwork and arranged it in a stack, which she is seen flung over. Abeles, who has been a visiting artist at UND, produced this print in the Department of Art & Design’s printmaking facility with the assistance of students. By working alongside professional artists, UND students are provided with unique learning opportunities. The students’ collaborations with visiting artists have been enhanced through Sundog Multiples—a printmaking venture created by Art & Design Professor Kim Fink, in conjunction with UND Art Collections, and generously funded by the Myers Foundations.